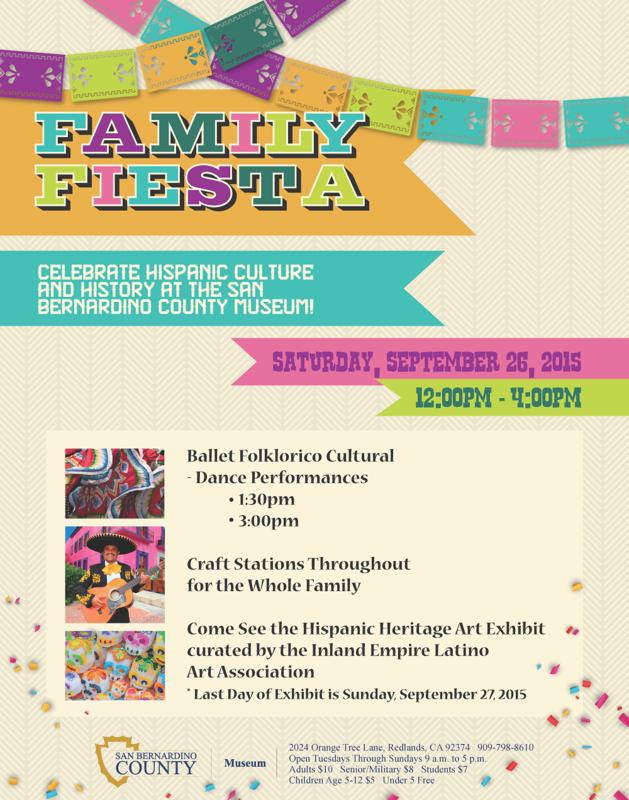 It’s a Family Fiesta at the County Museum on Saturday, Sept. 26! Ballet Folklorico performances will be at 1:30 and 3 p.m.
Lots of craft activities will be available for the whole family from noon to 4 p.m. And don’t miss the special exhibit, “Hispanic Heritage Art 2015,” curated by the Inland Empire Latino Art Association. Join us on Saturday to celebrate Hispanic Heritage Month! All activities are included with museum admission. The County Museum is located at 2024 Orange Tree Lane, in Redlands. We’re open Tuesdays through Sundays 9 a.m. to 5 p.m. Cost: Adults $10; Senior/Military $8; Students $7; Children Age 5-12 $5; Under 5 free.